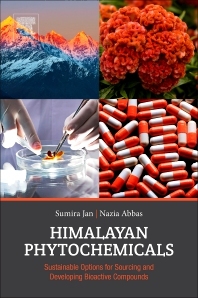 Himalayan Phytochemicals: Sustainable Options for Sourcing and Developing Bioactive Compounds provides a detailed review of the important medicinal plants which have already been discovered in the Himalayan region, outlining their discovery, activity and underlying chemistry. In addition, it supports a global shift towards sustainable sourcing of natural products from delicate ecosystems. Across the world, environmental destruction and overharvesting of medicinal plants are reducing and destroying multiple important sources and potential leads before researchers have the chance to discover, explore or synthesize them effectively. By identifying this problem and discussing its impact on the Himalayan region, Himalayan Phytochemicals: Sustainable Options for Sourcing and Developing Bioactive Compounds frames the ongoing global struggle and highlights the key factors that must be considered and addressed when working with phytochemicals from endemic plant sources. Sumira Jan has received numerous international and national awards, including the Korean Government Doctoral Scholarship in the field of the environment; and was selected for the BioCaRe Early Career Scientist Award, 2014; and for the prestigious Fast Track Young Scientist Award, 2015. Presently Dr. Jan is working as a Senior Research Associate (Scientist Pool Scheme), and her work is funded by the CSIR at the Central Institute of Temperate Horticulture. She has more than 35 research articles in international journals. In addition, Dr. Jan has authored four books. Her first book as lead author was published in 2016. Currently, Dr. Jan is engaged in metabolomic analyses of high-altitude herbs and their ecophysiology. Dr. Nazia Abbas is working as a scientist at the CSIR-Indian Institute of Integrative Medicine. She was selected for the prestigious INSA-Young Scientist Award in 2016 and the DST-INSPIRE Faculty award in 2014. Her current work focuses on the molecular and physiochemical aspects of medicinal plants of the Kashmir Himalayas.